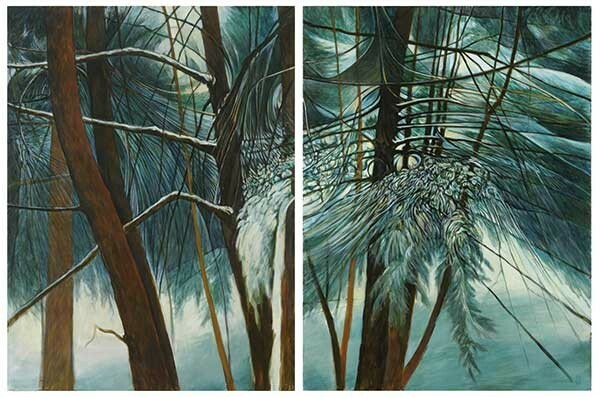 Snowy Thicket, a diptych by Chris Gonyea from the exhibit “Winter Paintings” at George Adams Gallery in Chelsea. 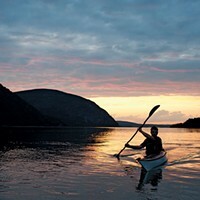 One of the Native American names for the Hudson River, a great estuary with tides connected to the rise and fall of the Atlantic, translates as "the river that flows both ways." But in cultural terms, for too long, the dominant narrative has contended that the metropolis of New York City is the center of the cultural universe, and everything beyond is, so to speak, provincial. The only exception would be artists who have already made good in the city, and who have used their expanding vision (and wallets) to move to more spacious studios upriver, in "the country." These days, "rural" is a purely relative term, however. 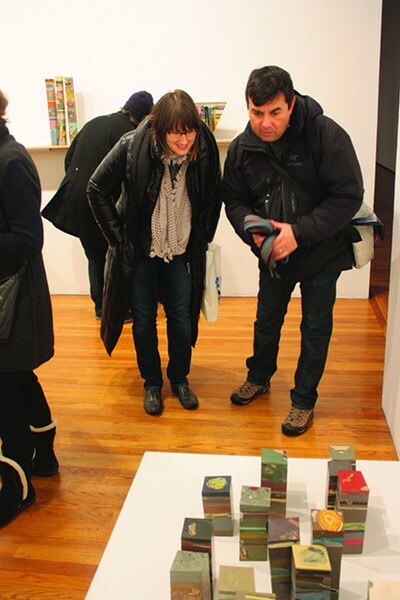 All along, there have been intelligent, creative types born and raised in the Hudson Valley, and who, with its reasonable geographic proximity to the cultural resources of New York, have been pretty well informed about the aesthetic debates on the art scene for years. 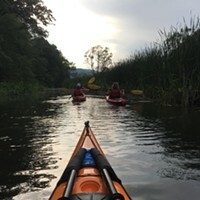 The new news is that the tide has been turning of late, bringing many of our own Hudson Valley artists into a more conspicuous position in the city, and in the process helping to shake off the tenacious vestiges of the old provincial ideas that still hang on in some quarters. February will see not one but two openings featuring work by Kingston native Chris Gonyea: a solo drawing show in Red Hook, Brooklyn, at Kentler International Drawing Space, and paired with Joseph Garlock in a painting show at George Adams Gallery in Chelsea. In his early career, Gonyea was primarily an abstractionist, making paintings that included collage elements that have been described as "industrial assemblage in high relief." A graduate of the Pratt Institute, his art was strongly influenced by the heterogeneous approach of predecessors such as Schwitters and Rauschenberg, exploring the disjunctive logics of those artists with greater emphasis on form, and less on reference. He continued in this vein even after he returning to his hometown of Kingston in the early 1990s, but eventually this native environment—which had originally lured the Hudson River School painters of the 19th century—inspired a significant shift in his style about 10 years ago, when he began to focus on the representation of nature, especially trees. These overtly representational drawings and paintings extend the same basic concerns about medium and materiality that had informed his earlier, abstract work. Gonyea's tree studies, based on photographs of stands of actual trees, in actual places (often literally in his own Hudson Valley backyard, or in other places he's spent time, such as Martha's Vineyard), share a sense of rootedness in a specific place that characterized Cole's and Church's work of 150 years ago, but they are not products of the Romantic sublime; if anything, they embrace the contradictions of life today in a way that would have literally been unthinkable for those historical painters. Drawing on the energy of the previous work, the repetitive patterns of branches and foliage take on a formal significance of their own, which the artist characterizes as "geometrical or rhythmic, patterns that are more the subject than the tree itself at times." On a fundamental level, all of Gonyea's work is abstract, but by melding that abstract sense with the familiar hook of the natural motif, he opens the door to a wider audience, and even wider possibilities of potential meaning. The Kentler show will feature his unique soot drawings, made using a process of his own invention. He catches the carbon from a dirty flame as he passes the paper over the rising column of smoke—in some of the drawings, one can discern the ephemeral feathering of the soot on the surface, which makes certain passages appear to come in and out of focus. Once the paper is coated in this way, he sets to work with an array of erasers, removing the areas left whitened (the "negative space" of the drawing), often in fine detail. By necessity, the soot works are relatively small, and involve a tremendous amount of fine detail work with the eraser, but ultimately serve to draw the viewer into a particularly close, intimate relationship with the image, heightening the one's sensitivity to the surface texture and materiality of the work, the abstraction generated by the pattern of the branches, and an almost hallucinogenic oscillation between figure and ground. The complexity of this work refutes the typical provincialism that too often infects considerations of art made outside the artificial boundaries of the gate keepers of Culture in New York. In December, for example, the venerable New York Times dedicated an article to the laudable efforts of Arts Mid-Hudson (formerly the Dutchess County Arts Council), but did so via a lopsided, marginalizing narrative that emphasized the organization's office located in a strip mall, and featured colorful photographs of children having their faces painted for Three Kings Day. I'm certain that there are plenty of arts organizations to be found within the five boroughs with similar programming, but you'd never find them featured as representative of "the art scene" in New York. "I think people believe you have to be inside the system to change it, which doesn't make much sense to me" says Laura Moriarty, another Hudson Valley native whose work—a unique fusion of painting and sculpture, with frequent references to plate tectonics—and innovative approach to her career subverts much of the received opinion. "I feel like I'm an odd duck because I always knew I would stay here." But living and working in Rosendale has not hindered the visibility of her work—last January she opened a show at the historic OK Harris Gallery in SoHo, which she found to be a good experience, even if it wasn't her ultimate aspiration as an artist. "The old system [in which an artist would find representation by a gallery, and then concentrate only on producing work] is really broken. We need to be honest about what really does matter, and to understand that the old narratives don't hold water anymore." What really does matter to Moriarty is for artists to address the new state of affairs by inventing new ways to develop their work and careers--in her case, doing things like self-publishing a catalog of her work featuring serious writing about it in order to clarify its critical position. Artists today need to develop an array of skills above and beyond simply making the work—they can't just sit back and leave a gallerist in charge of organizing an exhibition strategy or hope to get the attention of the ever-shrinking universe of art critics/publications: They need to take control of their own professional destiny. Work from Laura Moriarty’s opening at the OK Harris Gallery in SoHo. 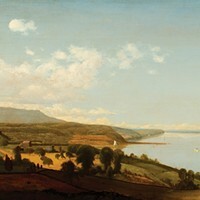 While the geography of the Hudson Valley is still an important component of the aesthetics of everyday life in these parts, it is increasingly encouraging to see artists like Gonyea and Moriarty who manage to move beyond the outmoded definitions of city versus country, inventing new modes of artistic expression that can help us all figure out where and what we are to be in the brave new world of the 21st century. Chris Gonyea, "Winter Paintings," George Adams Gallery, 525-531 West 26th Street, New York, through February 28. Georgeadamsgallery.com.